Was that a smug look on Marvin's face? Could our hero possibly be thinking, well, less than charitable thoughts about getting even after being heckled by Billie and some of the others? Would Marvin J. Mavin do such a thing? Marvin smiled, and said, rather loudly, "Hmmph. Well, son, that was a logical move, but unfortunately, it won't get you a win!" Billie seemed taken a bit aback. He thought for a moment, remembering his teacher's instructions to be "on your best behavior," and then replied with a snicker, "Wanna bet, beer belly?" There was a ripple of laughter from the audience, although clearly the adults in charge seemed rather unhappy with this turn of events. "Well, young man, I imagine I had better teach you a lesson," said Marvin in his most authoritarian tone. 17x26 31x22 1-6 28-24 4-8 23-19 6-10 19-16 8-11 16x7 2x11 24-19 9-14 32-28 5-9 27-23 11-15 30-25 15x24 28x19 9-13 25-21 13-17 22x13 29-25 13-9 25-22 9-6 22-18 21-17 18x27 17-13 Drawn. "And now, my fine little friend, what do you think?" asked Marvin. "Uh, I, well, uh, ya know, I 'spose mebbe it's like, ya know, a draw or sumthin'.....," stammered Billie. "And INDEED IT IS! It's a DRAW!" exclaimed the hero of the Doublejumpers. "Shall I show you how you should have played it?" he added. Billie's face had that "I'd rather be anywhere but here" look, and the crowd didn't seem very happy, either. 28-24 1-6 24-19 9-13 19-15 17-21 15-11 29-25 26-22 25x18 23x14 13-17 31-26 6-9 14-10 9-13 26-23 17-22 10-7 22-25 7-3 5-9 23-19 2-6 3-7 9-14 19-15 13-17 7-10 6-9 27-23 25-29 10-6 9-13 6-9 White Wins. "It's not a simple win, and White has to play it correctly, but the win is there IF you are good enough to figure it out!" Marvin concluded. But Billie had slunk back off the stage, muttering to himself something about how computers make funny-looking moves. Surprisingly (or perhaps not so surprisingly) there was no applause. The young audience was filled with frowns and sullen looks. Their school champion, Billie, had been shown up by Marvin. Now, at first one by one, and then a few at a time, and finally in large groups, the audience began to silently exit the auditorium. In just a few minutes, there was no one left but Marvin, a few teachers, and the Principal, Mr. I. B. Cylindrical. This latter august personage went up to Marvin, shook his hand, and said, "Um, yes. Well. Um, thanks. Yes, thanks. For visiting our school. Um, the children, yes, the pupils, well. It's clear how much they admire you." There was a long, quiet pause. "Um, seems cold for April, don't you think? Yes, um, cold. It feels chilly in here." Mr. Cylindrical continued with a few more equally apt remarks as he accompanied Marvin out of the auditorium. Marvin then said his farewells and crossed the parking lot, where his 1973 Volkswagen Beetle was waiting to take him to the nearest bar. 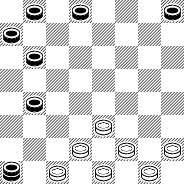 The "Fun Shot" is almost never seen in published play; in fact we were only able to get our hands on a single game, with Derek Oldbury playing White (and winning) against a computer program that was only moderately strong by today's standards. Yet, despite the fact that the experts we consulted (up to the grandmaster level) are clear in their judgment that White should win, nevertheless the win takes some effort. Billie's move, 26-22, seems natural enough and yet only draws. We took a look at the various options with KingsRow. KR (at 25 plies) rates 28-24, the winning move, at -24, which means about 1/4 of a man advantage to White (-100 would be a full man up advantage, more or less). -24 is barely enough to call the game a win. Other moves were 23-19 at -16, maybe a win; 27-24 at -10, marginal at best; 23-18 at -6, a likely draw; and Billie's 26-22 at -1, a draw for sure. An interesting aside: the winning move, 28-24, preserves for a moment the "D'Orio triangle," but that's a whole different controversy! There are many possible variations in the lines of play shown in the article text; we didn't annotate these as that would make for an extremely long writeup. But the play shown (generated by KingsRow in both draw and win variations) gives a good idea of how things could go, although we are the first ones to point out that some of the moves have that "computer" flavor. Should you try the "Fun Shot" in your own play? Well, that depends on the circumstances. In a serious high-level tournament, probably not; but in club play, for something different, "just for fun" it is surely worth a try, although you shouldn't expect to do better than draw with the Reds, and you'll need to be prepared for the possibility of a loss.